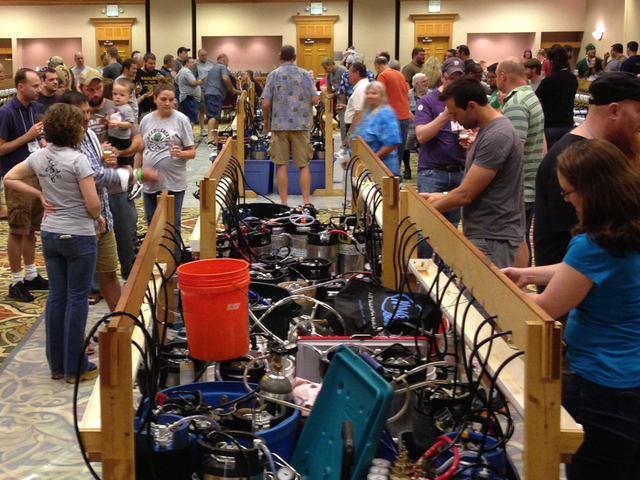 As I said, BJCP focuses on helping homebrewers by judging homebrew competitions. If you’ve made a bad batch of beer and can’t figure out what’s wrong with it, judges can tell you what you did wrong and how to fix it. If you have a good beer and just can’t quite place what’s wrong, they can pinpoint it out. Best of all, if you have a great beer the judges will recognize that, and you can win a competition. Homebrew competition prizes range from a medal or trophy up to having your recipe brewed by a professional brewery! The BJCP uses homebrew competitions to promote greater beer literacy among homebrewers and the general public. They do this through development and definition of style guidelines. The style guidelines describe many items of the 80 beer styles covered including: aroma, appearance, flavor, mouthfeel, overall impression, history, ingredients, vital statistics (OG, FG, ABV, SRM), and commercial examples. All these things give the home, and commercial, brewers an idea of what they should be achieving in the beers they brew. Of course, there is some downside here in that as an all-volunteer organization the style guidelines take some time to update. There haven’t been revisions for six years. This delay leads to some gaps between what is happening in homebrewing, commercial brewing, and the style guidelines. A good example of this is the lack of any Cascadian Dark (aka Black IPA) style. If you’re beginning to get interested and think this sounds like a fun group you want to be part of then, listen up now; It’s easy to start getting into the BJCP, heck we’re desperate for people. The best way to get started is to steward a homebrew competition. Stewarding means you’re fetching beer, crackers, water, pens, or paper for the judges. It also means that you get to listen, watch, observe, and best of all usually taste with the judges. Once they’re done judging that beer, you tally up their scores and can review their notes. The times I stewarded I learned a lot and fast. After a time though I got the itch to judge. The road to judging is an easy one, you just ask. You’re first time out you’ll get paired with a higher level judges who will help you along and show you the ropes. Upping your game from there means taking the tests. I’ve found the BJCP classroom training format to be extremely valuable. First, we sample a wide variety of beers, commercial and homebrew, which often cover opposite spectra of the style guidelines (and sometimes, out of style). Second, the teachers (who are ranked judges) push us to be more descriptive with our assessments. They help us expand our vocabulary and find ways to give meaningful feedback to the brewer. Third, the group format allows you to see how other perceive different elements of a beer’s aroma, appearance, flavor, and mouthfeel. This can help you expand your perceptions and think of different ways to approach your judgement. The class also practices calibrating your ratings as a small group – similarly to what happens in an actual competition. There is also a fair amount of time spent on the brewing process and ingredients used. Which would be especially useful for someone who does not homebrew. Overall, the approximately $100 class fee is a bargain for the experience and knowledge gained – oh, plus all the beers you get to sample! Doing it again I’d go the course route, but I got by OK on my own. If you’re more an independent learner than I suggest you begin by printing out BJCP off-flavor flash cards and BJCP Style Presentations. Get to your favorite build your own 6-pack spot and pick up a few beers from a few styles then sit back and study the sheet for the style. Reading the off-flavor cards will help a bit, but you need to get to an off-flavor tasting to know when things are wrong. Luckily I haven’t run into any tremendously bad beers when judging competitions, but if one comes across your table, you need to know what’s wrong and how to fix it. There are two tests on the road to getting certified. The first one made me feel like I was being hazed out of the program. A multiple choice question about the OG of an E.S.B. is useless when it comes to judging beer. This test is online and timed with all multiple choice questions, most of which are relevant to judging. Lots of focus on style histories, flavors, brewing techniques, judging protocols and processes. It’s pretty rough, took me two tries, but is doable and you find out how you did in seconds. After you pass the online test, you reach the hardest part, finding a seat in a tasting exam. It took me six months of contacting people from Indy to Lexington, to Columbus. Finally, three days before a scheduled exam I was contacted by the exam proctor who let me know that a few spots had opened up. I canceled my plans for that weekend and drove to Columbus. The format of the tasting exam is identical to a real homebrew competition, except you don’t get to talk to the other judges. You get a beer and are told the style then you describe what you see, smell, taste, and feel. Do your best, use lots of descriptive words that you remembered from studying the style guidelines, and enjoy some beer. Now comes the wait. The average turnaround time on getting your tasting exam is 5 to 6 months. Remember, these are all volunteers who are judging these exams after they work 40+ hours a week. I was lucky and got my results back in just over four months though I’ve heard of people waiting more than eight months. inuHopefully, this has enticed some folks to think about joining the ranks of the BJCP. More homebrewers are entering more competitions every year, but those numbers are going up a lot faster than judges and stewards. The bottom line is this, do you enjoy drinking beer and want to learn more about it? Then find a local homebrew club and steward a competition to start going down the road. I’ve been wondering how one goes about becoming a certified beer judge, so I found this post to be extremely informative. Congratulations on passing and thanks for the great post. Congrats on becoming Recognized, Tom. Some great info here! Next Next post: The Beer Alphabet Game!